Time: From the entering the Penllergare Woods to old Tirdonkin mining area, roughly takes 25 minutes. Car parking: From Lezzet’s Café (2012), old Pit Stop Café shown on map, on the A48 about 500 meters from Penllagare roundabout. Walking: Enter the gate of the Penllagaer Valley Woods on the left, you’ll see a plenty of information and a map as you enter. The easiest way after looking at the map, keep walking left and after about 15 minutes you will come to a very wide gate, over or around the gate and it’s about 10 minutes away. You will come to a junction, on the left was an old quarry, and on the right are another track and also an opening in the trees where you enter. 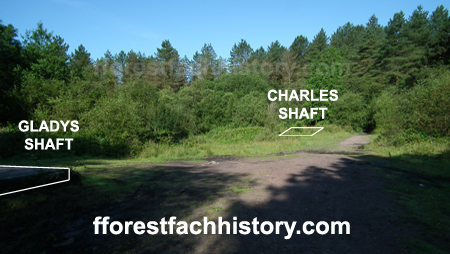 After entering, on the left is the Gladys mineshaft concrete cap, with the Charles shaft about 30 meters away. Please see photo below showing the illustration with white outlines. I found this is to be a lovely walk and I recommend walking shoes/boots or wellies as the path can be very muddy in places. Don’t blame me for any incorrect information, falls, breakages, and mishaps or even getting lost. (This is all done at your own risk! ), I’ve done my best to explain. The principle seams worked were the 5 ft. & 6ft. steam and manufacturing coals , with the 3 ft. used for only a short time. Workings were by "Pillar & Stall" method. Earlier versions: "Tir-dwncyn", "Tirdwncyn" "Tir-donkin" and currently "Tirdonkin"
The main railway connection runs east to (disused) Cefngyfleach colliery. The 2012 photo above showing only a quarter of the Gladys concrete cap. The concrete cap of the Charles shaft is a larger size than his sister and overgrown, but with some patience can be found. 1900 - Cefngyfelach to Tirdonkin Railway extension, the railway followed the almost "L shape" of the tree line. This 'memorial 1' inscription is at the rear of Charles shaft. The inscription was very nearly unreadable, so I rubbed chalk in the faint description for this photo in 2012. This 'memorial 2' inscription is at the rear of Charles shaft. The two mines history of Cefngyfelach and Tirdonkin are interwoven. 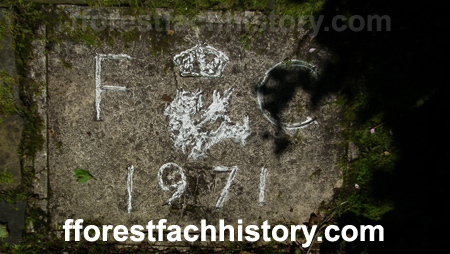 when it is entered as being the property of the Cwmfelin Tinplate Co.
A mineral railway, roughly two miles long was built from Cefngyfelach to join the Great Western Railway at Cwmfelin. The contractor was a Mr.G. Hanney, of Morriston, supervised by the colliery manager, William Morgan. The cost of £7000 and. was worked by locomotives, the first loco ran to Cefngyfelach on 1st May 1896. After this date there was room for expansion, the need was taken up further west under the Penllergaer estate of Sir John Dillwyn Llewelyn. at Cefngyfelach, Llangyfelach, James Morgan, aged 29"
www.swansea.gov.uk, cambrian online search index. The manager of Cefngyfelach, William Morgan, declared that his company was to win the coal at Tirdonkin. The 5 ft, and 6 ft coal seams to be worked. Initial work started on Tirdonkin colliery. railway connecting Tirdonkin colliery. This was more or less finished by the middle of the same year. An opening ceremony to mark the sinking of Tirdonkin colliery, behind Tirdwncyn Farm. The son and youngest daughter of Sir John Dillwyn Llewelyn. 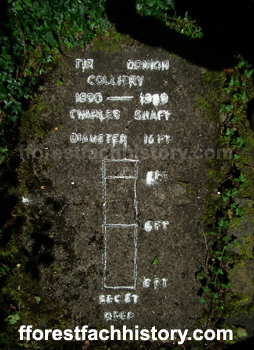 Captain Charles Llewelyn and Gladys cut the 1st sods of the two mine shafts (upcast & downcast) and were named in there honor "Charles" & "Gladys", both pits were brick lined and 16 ft. in diameter. (GJ.32) P63 TIRDONKIN & CEFNGYFELACH 1903 Sep. 6th At the Gladys Pit the 5 ft. seam was struck at approximately 450 feet below ground. Cefn Gyfelach Colliery Company (CGCC) to the Tirdonkin Collieries Company (TCC). In the Charles Pit they struck coal, no reference to which seam. (R.L) P80 THE COLLIERS OF THE SWANSEA. The mine abandoned the 4 ft.seam in this year. (WM) Q54 CRIME AND PUNISHMENT etc. Glamorgan assizes: John & others -V- Tirdonkin collieries Ltd. Mynydd bach chapel, Cefngyfelach, alleges mining damage. Relates to Cefngyfelach colliery! Trustees of Mynyddbach chapel sue Tirdonkin collieries for damage due to subsidence. History of the building. Relates to Cefngyfelach colliery! (WM) J21 MINING AND INDUSTRY etc. Mynyddbach chapel -V- Tirdonkin collieries: Witness - Rev John Daniel, an aged and deaf minister. Relates to Cefngyfelach colliery! Mynyddbach chapel -V- Tirdonkin collieries: Witness - John T. Morgan, foreman to messrs Walters & Johns, contractors. Relates to Cefngyfelach colliery! Mynyddbach chapel -V- Tirdonkin collieries: Witnesses - Daniel James, Cae Mawr Rd, Morriston; William John, Caersalem. Relates to Cefngyfelach colliery! Mynyddbach chapel trustees -V- Tirdonkin colliery re subsidence. Witnesses for the colliery, William Morgan, John George. Relates to Cefngyfelach colliery! (WM) Q52 CRIME AND PUNISHMENT, FIN etc. Mynyddbach chapel -V- Tirdonkin collieries: Witnesses - Abraham George, builder, Swansea; Mr Morgan, colliery manager. Relates to Cefngyfelach colliery! (WM) P64 CRIME AND PUNISHMENT etc. Tirdonkin first appeared as a working colliery in the List of Mines. (Lord Glantawe) reported a loss of £3,428 in the year 1905, but things were beginning to pay. The striking of the 6ft seam in the Gladys Pit meant that both seams were in production. In 1908 the GWR started to construct its Swansea District Line to serve as a Swansea by-pass to Swansea docks. The Kings Dock opened in 1909. Tirdonkin's lease was increased from 600 acres to 1050. The 5ft. seam had been abandoned because of the Tirdonkin fault. 60 year lease was taken out. The 300 men have been out on strike for nearly six weeks, there felt a need for the colliery to come under police protection. Hope of a settlement. 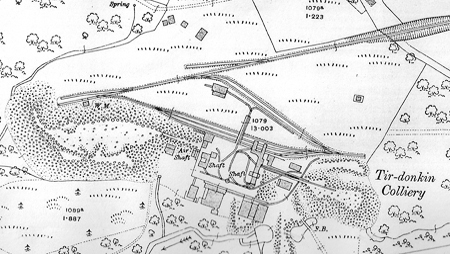 The TCC put in a connection about half a mile long from their railway at a point about 650 yards east of Tirdonkin to join the Swansea District Line, probably opened in July 1913, since it is shown on the 1914 OS map. When this new connection was completed, the old railway line south of Cefngyfelach to Cwmfelin was taken up. His co-directors and daughters Olga Violet Daniell and Elaine Jenkins. Fforestfach Funeral of the late Mr. Richard Bowen (Gendros), took place at Babell, Fforestfach. Deceased, aged 48 , met his death at Tirdonkin Colliery owing to a fall of roof. He was a deacon at Jerusalem C.M. The following ministers officiated:- Revs. W. Rawson Williams (Jerusalem), J. Richards (Babell), E.J. Hughes (Calfaria), and D. Jenkin Jones (Saron). The chief mourners were: Mrs Bowen (widow), William John, Miriam and Edwin Bowen (children); Mrs Bowen (mother); Mrs Jenkins (sister) and Jenkins; Mrs Thomas (sister) and Mr. Thomas and numerous other relatives. (TCC) was sold to Lewis, Stephens & Co. of Swansea, and completed in June. Broad Oak and Samlet Collieries. The Tirdonkin Collieries Company was put into liquidation within a few months and a new company was formed named the "Tirdonkin Merthyr Collieries Limited". and, I believe, not a day too soon." A recorded daily output of 1,209 tons was achieved, in the following July a weekly record of 7,419 tons. All the pits to the north-west of Swansea were drained by a Cornish Beam pumping engine at Callands Pit, originally called (Townsend), Landore, which stopped pumping in this year. Expensive new pumping equipment was installed in the 6 ft.
seam at Tirdonkin, but it became uneconomic to work the coal. Work probably ended after the Tirdonkin Merthyr Co. was put into liquidation. 1913: 337 men and coal extraction cost between 11s. 2d. & 12s. 2d. 1913/15: working the Swansea Five-Feet seam Mr. D. Howell manager. and 54,020 for shipment to France. Coal extraction cost 20s 10d. 1916: employed 337 men with Mr. Howell still the manager. 1922: 800 men who produced record levels see: March of this year. 1923 it was owned by the Tirdonkin Merthyr Company - 518/150 men. 1927: 770 men employed with the manager being F. Hargreaves. "The Tirdonkin Colliery was separated from the workings of the latter pits by a wide barrier, but the water percolated through it and also through the strata in such quantity as to drown out the pumps and cause the abandonment of this colliery also." There is very little left that connects the two collieries. Directions: 200 meters north of Maes Sant Teilo, Llangyfelach Road, Llangyfelach. Facing west, you will see a large gate in black and yellow, stopping vehicle access. This road connects with Mynydd Newydd Road. If you walk up the gentle slope for about 200 meters, you will see on the left and right stone abutments which originally carried the mineral railway between Cefngyfelach on your left and Tirdonkin on your right. The farm land on the right still has a tree line and path leading towards Tirdonkin colliery, seen using Google satellite views.